NYC, 04/18/2019, 2:00PM. 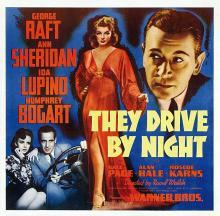 They Drive by Night (1940): Film-Noir Drama Starring Humphrey Bogart. Starring George Raft, Humphrey Bogart, Ann Sheridan. The film was based on A. I. Bezzerides' 1938 novel Long Haul. Part of the film's plot was borrowed from another film, Bordertown (1935).